Although I've been enjoying the sport of running for almost 20 years, and have participated in numerous races, last spring was the first time I had ever run in a marathon. It was an incredible experience, but I have to say that I could not have done it without all of the wonderful advice given to me by so many other seasoned runners. Training well and training smart will make race day even more fun because it will help you to relax, have faith in your preparations, and go after your goal with confidence. 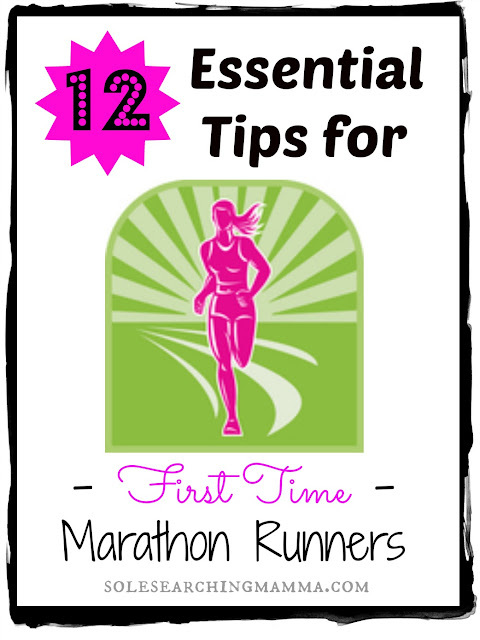 Here are 12 of the most essential tips that I believe will help make your first marathon a success! / 1. / Hydration is extremely important for all runners, especially distance runners. On your longer training runs (6-20+ miles), drink something with electrolytes 30-45 minutes before you head out. (I usually drink 6-8 oz., and LOVE NUUN electrolyte tabs.) Then, be sure to drink while you run. DO NOT wait until you feel thirsty to drink. Your muscles are 80% water - so they need water to work! Don't worry if it feels uncomfortable to drink at first, you will get used to it. Just sip an ounce or so at a time. You dont' want to hear water sloshing around in your tummy - that's too much! There are many hand held bottles and hydration belt options to choose from, so pick one that's right for you (I like the Nathan brand). You need to keep practicing until it feels natural - DON'T wait until race day to figure out how to hydrate while you run. When you see other runners passing out from dehydration along the course, you'll be happy that you did! / 2. / Wear the right shoes - NOT the pretty shoes - the RIGHT shoes. And, don't go into a store where the teenager says to you, "Well, I think that these are cool, try these on!" and buy a pair. Do your homework. You need to know your foot shape, your gait, and correct shoe size (I actually wear a 1/2 size up in my favorite shoe). Then, try on several pairs until you find one or two that fit well and feel good. Buy two pairs and alternate wearing them when you train. This allows time for the mid-sole and cushion to de-compress after a run. There are a lot of specialty running stores out there with experts who can help you. If you have access to one of these stores, I highly recommend starting there. You can read more about finding the perfect shoe here. / 3. / On your longer runs (8+ miles) try using an energy supplement. Once you find one that is comfortable to consume, tastes great, and gives you the energy you need, stick with it. I have a pretty sensitive stomach, but found Honey Stinger Chews to be very easy to digest and they give me instant energy (plus, they're delicious!). DO NOT try different energy sources on race day unless you have used them and tried them before. You don't want to find yourself bent over with stomach cramps 2 miles from the finish line. I dropped one of my sacks of chews along the marathon course and was worried that I wouldn't have enough fuel to sustain me during the race. Toward the end of the course, volunteers were handing out GU, and I was tempted to try some, but followed my friend's advice and used only what I knew my body could handle. I'm really glad I did! / 4. / Consider adding B-Vitamins to your daily diet. Running long distances for 3-4 months of training is a stress on the body. Even if you're eating and sleeping well, you still need extra nutrients. B-Vitamins are key. I take a B-Complex twice a day and also pop a sublingual B-12, such as Source Naturals MethylCobalamin, before I run and every mid-afternoon for a boost of energy. The B's will help keep you from feeling run down and give your immune system the support it needs to carry you through training. Be sure to drink plenty of water when you take your B's so the body can assimilate the nutrients! / 5. / Don't discount your short runs. It's easy to fall into the temptation to skip the 3, 4 and 5 milers, because they can't be as important as the long runs. Wrong. Every run counts, and every run helps keep you mentally focused on the marathon goal. Sometimes my short runs would almost feel more difficult than my long runs. Crazy! If I went out for a 4 miler and found myself struggling, I would change it into a tempo workout or walk a 1/4, jog a 1/4, build up to 80% for a 1/4 then repeat. Give yourself permission to walk - it's okay! Changing up the routine always helped me finish the run, and kept my confidence and focus strong. / 6. / For any run 12 miles or more, ice baths are a must. Yep, I said ICE baths!! The first time I tried to take one, I was skeptical, but completely amazed at how it reduced post-run soreness. There are probably many ways to do it, but I just fill the tub with cool, not cold, water. Sit in the water in your undies and a long sleeved shirt tied in the front. Pour 2-3 large pitchers of ice into the water, particularly over the thighs. Sit for 15-20 minutes. Sipping on hot tea and reading a running magazine helps take your focus off of the cold. Then, finish with a warm shower. / 7. / On you longer runs (15 + miles) if you find yourself really struggling to get through the last couple of miles because you feel tired, consider an alternative energy source such as peanut butter pretzels. Or, if after your long runs, you feel sick to your stomach, this may be a sign that you need to eat more to keep your blood-sugar levels steady throughout the run. I was amazed at how well this simple food kept me going. I packed some for the marathon and nibbled on them from mile 12 on. The combination of simple carbs, salt and protein worked like magic! But, again, practice using them on training runs first. / 8. / Look at your training schedule, find your longest run and highlight it. That is your dress rehearsal run. Using this as a "practice" marathon will prepare not only your body, but your mind as well, for the big day. Wear your race day clothing and shoes, fix your hair the same, set up your playlist, and pack the same hydration and energy that you will use that day. I remember the day that I finished my 20 mile run, everything went pretty smoothly and I literally jumped up in the air and shouted out a big fat "YES!" because I knew that the marathon was going to be possible. Proper practice is key. / 9. / With #8 in mind..... DO NOT do anything new on race day. DO NOT go out and buy new shoes, no new clothing (unless it's an emergency), new fuel etc., etc. Stick to what you've used, stick to what you know works. Don't abandon the plan. My only exception would be if you forgot to pack something essential. I saw two different guys running in cut off jean shorts. Oooo, can you say chaffing??? Don't be that extreme! But, you get the picture. / 10. / Glide. All over. Glide. If you don't know what it is, read more about it here. Use it on your long runs to prevent chaffing, and take it with you to use before the race (don't forget bra-lines, inner thighs, inner arms and chest). YOU WILL THANK ME!! / 11. / If you can, invest in a Garmin type watch to wear while training (to help you log exact mileage and keep time) and for race day. Some of you may not care about your race time, and that's fine, but if you set a pace goal or a finish time goal, then wearing a watch can help you stay on track. Remember, the time that they post along the route is the race start time, not your chip time. And, if you have to stop to use the porta-johns (which I did), then you can stop/start your watch accordingly. For example, my clock time was 4:15, chip time 4:09 and Garmin time 4:05. I wanted to finish around the 4 hour mark, and was able to use my watch to help keep the right pace. / 12. / Lay your clothes, shoes and gear out the night before the race, so that there are no surprises the next morning. If you happen to oversleep, you're one step faster to getting out the door. Don't skip breakfast! You need the fuel! Eat what you're used to eating from your training - remember, nothing new! Also, you may want to see if your race has a bag check, and if they do, pack a pair of flip-flops and an extra set of clothes - don't forget the undies! (especially if you are running on a warm day) to change into after the race. If they don't have a bag-check, ask a friend or family member to bring your necessities with them when they meet you after the race. Thanks for all the great tips...I will use them! Blessings! Just starting to think about checking run a marathon off my bucket list. This is a great list that I'll have to come back to if I ever "pull the trigger". Great tips, this is good info for a first timer and even a great reminder for any marathoner! Thanks for sharing! While I never ran anything over a 5K (and have zero plans to)my husband was one of those extreme racers. (Iron Man, 100K type deals) and your tips bring back so many memories. You are spot on with every single one. Great tips. Similar to what I have done for all of my half marathons. I will be tackling my first full in 2014. Thanks for the tips! I'm training for my first marathon and can use all the tips/advice I can get! Best of luck to you, Jen! You are going to do great! I hope that you have so much fun that you want to run many more races in the future!! Great advice thank you. I am running a marathon in 7 weeks. I'm training for my first marathon. It is 7 weeks from now - Thank you for the great advice.